New Math: B minus C+ = $1.3 million!?!? 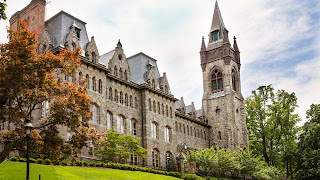 It’s not often that our alma mater makes national headlines, but Lehigh University was back in the news today, not because they beat Duke in the NCAA Tournament again, but because a fellow graduate has sued our fine institution for $1.3 million. Lehigh’s crime is allegedly having the audacity to give Megan Thode a C+ in a counseling and human services fieldwork class when she needed a B. How dare Lehigh expect its students to meet rigorous academic standards! Not only did we receive an “unfair” grade or two (…or ten) in our day, but Lehigh took away our dream of becoming a major league baseball player. After a respectable freshmen season, Lehigh ignored our potential and cut us from the baseball team. Lehigh's action made it all but impossible for us to pursue our desired occupation as second baseman for the Chicago Cubs. In 2012, the average major league second basemen made $3.2 million per year. Had Lehigh not cut us, we would have continued our baseball career all the way to the major leagues, playing for 8-12 years, plus lucrative coaching and broadcasting opportunities after our playing days were over. We’re getting lawyered up as we speak, but we think we’re owed at least 20 million bucks. Seriously, Ms. Thode is a surefire contender for 2013’s most ridiculous lawsuits list. Add this to the never-ending, and far-to-often frivolous, patent, copyright, medical malpractice and discrimination lawsuits, and it’s clear that our legal system is broken. Not only do these lawsuits overwhelm our courts and judges, they are killing our economy by siphoning billions out of our pockets through higher prices (legal costs passed along to customers) and reduced productivity (spending time and money on legal proceedings rather than research and development). Luckily, we have a very simple and elegant solution. In fact, it’s a tried and tested solution that just about every other legal jurisdiction in the world already has in place. Done. In one simple sentence, it’s estimated that each American family would benefit to the tune of $3,500 per year. No new taxes, no increased regulation, no deficit spending required. For a detailed illustration of these costs, a survey of 36 Fortune 200 companies administered by Northwestern Law School shows that those 36 companies spent over $4 billion in 2008 on litigation costs. This $4 billion is just the cost of litigation – it does not include any settlements or damages awards. Extrapolate this out to the entire Fortune 200 and that’s over $20 billion in litigation costs funneled away from research and development and into lawyers pockets. Some of these costs will be legitimate legal expenses incurred during the normal course of business, but too much of it will be spent fighting frivolous lawsuits. How many of these frivolous lawsuits would be avoided if the Plaintiff faced the possibility of paying a significant penalty if they lost (i.e. the Defendants legal costs), and their lawyers faced the possibility of not collecting their fees? Most, if not all. But won’t this scare away Plaintiffs who have a legitimate legal gripe? No. This proposal does not take away anyone’s right to sue. If you have a strong case, you shouldn’t be concerned about losing and can expect to settle or win outright on the merits of their case. Similarly, no lawyer would turn down a pro-bono case that was virtually certain to result in a windfall of fees. Loser pays takes away the lottery ticket mentality of the legal system as we know it, and it’s about time. What are the chances that Ms. Thode sues Lehigh University if she’d have to pay their legal bills when her case is thrown out? Nil. And that’s the way it should be. Lehigh should be spending its money on need-based scholarship to eager and accomplished students, not on defending itself from immature and entitled freeloaders. Who’s more valuable - the performer, or the owner of the stage on which the performer performs? It’s an age old question, but has been at the forefront of the sports world after the recent NBA and NHL lockouts. It’s also the underlying issue in the professional commentariats ongoing outrage towards the NCAA it's principle of amateurism. The NCAA doesn’t pay its athletes but makes billions from their efforts. Isn’t that just terrible? Did Andrew Luck and Derrick Rose generate megabucks for their respective schools and the NCAA? Absolutely. Did Andrew Luck and Derrick Rose get a cut of that revenue during their combined four years “working” for the NCAA and their schools? Other than free education, no. Did Andrew Luck and Derrick Rose benefit financially because of their involvement in NCAA events? Immensely. Let’s not cry for Andrew or Derrick, or any other NCAA superstar (the case for paying college athletes can only be made for the elite basketball or football players at a handful of schools – there is no justification for paying a baseball player, a cross-country runner or a field hockey player). First and foremost, these superstars, and thousands of non-superstars across all NCAA sports, are compensated for their efforts by receiving a free college education. What they choose to do with that opportunity is irrelevant - it’s an opportunity nonetheless. Against the backdrop of the billions being made by the NCAA and big time athletic programs, a scholarship may seem inconsequential, but for the vast majority of NCAA athletes, this represents a huge benefit, and a benefit commensurate with the effort and revenue produced (if any). The cost to attend Stanford - all covered by a full scholarship - is almost $60,000 per year. Therefore, a 19 or 20 year old athlete with a full ride to Stanford is “making” almost $60,000 a year in exchange for their athletic talents. Sure, it’s paid-in-kind with credits toward a college degree, but it’s still $60,000 less than what their classmate, who is not a star athlete, has to pay (or borrow) for those same credits. It’s bothersome when some people disregard this fact when complaining about the lack of compensation for NCAA athletes. What did you make when you were 19? Secondly, and much more importantly, these star athletes are given a huge stage from which to advertise their value to future employers. It’s no different than an intern at a production company, music studio or bank, except that those interns would never make anywhere close to $60,000 per year. They are happy to work for free because they benefit by making themselves more marketable to paying employers. NCAA athletes should feel the same way. Without the exposure generated by starting for Stanford for three years, does anyone think Andrew Luck would have been picked first in the NFL draft, reaping the rewards that come along with that selection – $22 million over four years? Without electrifying performances on the huge stage that is the Final Four, does anyone think that a few months after his freshman year Derrick Rose would be the first pick in the NBA draft and would sign a $10 million two-year contract? For the sake of argument, let’s assume Rose was allowed to enter the NBA straight out of high school. Let’s also assume that his amazing year at Memphis and electrifying run to the National Championship game only increase his draft slot 5 spots (Rose was considered the 5th best prospect in the country his senior year at Simone High School in Chicago). The 5th pick in that draft, Kevin Love, signed a two-year $6.5 million contract. Essentially, the NCAA, and the exposure it provided Rose, made him $3.5 million dollars richer. Even if we think he might have been the #2 pick straight out of high school, he still "earned" $1.1 million dollars by playing just a single season for the University of Memphis (the #2 pick, Michael Beasley, signed a two-year $8.9 million contract). The same logic works all the way down the talent chain, and we would argue that the biggest beneficiaries are actually those who's college careers open the door for a professional contract. A minimum salary in the NFL or NBA is 10-20 times larger than the starting salary of an average college graduate. Amateurism in the NCAA isn't going away, and it shouldn't. In addition to the principled points above, the practical (who gets paid, how much, and where does it come from) and legal (Title IX) issues make any discussion around paying athletes a waste of time. The NCAA is dysfunctional, no doubt, particularly their draconian efforts to enforce amateurism, but this dysfunction is a result of incompetence and arrogance, not the principle of amateurism. THE PRESIDENT welcomes POLITICAL OPERATIVE and they take a seat on a couch. POLITICAL OPERATIVE: Mr. President – what if I told you I had a fool proof way of losing fewer independent votes than expected? POLITICAL OPERATIVE: We crushed this demographic in 2008 because you were a rock star...that star has faded and we’re going to lose some of those votes. The key is limiting those losses. THE PRESIDENT: Star has faded? Really? THE PRESIDENT grabs and opens a White House micro brew off the coffee table and gestures to the POLITICAL OPERATIVE offering him one, the POLITICAL OPERATIVE shakes his head and continues. POLITICAL OPERATIVE: Yes, and yes. The truth will set you free, Mr. President. Current circumstances make it difficult for us to brighten your star, so in order to keep the equation in our favor, we need to dim the Republican star. You know, cut down their legs to make us look taller? THE PRESIDENT: Uh…OK, but how do we do that? THE PRESIDENT: A "War on Iran" or a "War on Immigrants"...maybe, but a "War on Women"? Why would they wage war on half the electorate! POLITICAL OPERATIVE: They would never voluntarily start a "War on Women" - so we have to create the illusion that they have. If you’re an independent voter, what’s the one thing that makes you most concerned with voting for a Republican? THE PRESIDENT stands up and walks over to the window, and gazes into the dark night, beer in hand. THE PRESIDENT: Other than having to lie at cocktail parties? POLITICAL OPERATIVE: Exactly, the root of that shame is voting for someone with out-dated social beliefs. Scores of independents are fiscally conservative and have a big problem with our progressive economic policies, but they are not registered as Republicans because they are allergic to the highly religious and uber-conservative social views of the Republican Party. POLITICAL OPERATIVE: I'm sorry Mr. President, but the taxpayers are on the clock and I'm very expensive. The question is how do we best exploit that tension? THE PRESIDENT: Yes, sorry, that is most certainly the question. POLITICAL OPERATIVE: The answer is a two prong attack. First, we pick a fight with religion, specifically the Catholic Church, by issuing a seemingly banal requirement out of HHS that all insurance policies must cover items like birth control pills, abortions, the day after pill - all for free. THE PRESIDENT: But doesn't everyone like free stuff? POLITICAL OPERATIVE: Yes, but the Church and the far right will object to paying for things that for which they have moral objections. They will say it’s an attack on their religious freedom. Fox News will be apoplectic about our "over-reaching attack on religious freedom." All of this will play right into our hands. We let the fervor reach a boil and then characterize their objection as a “War on Women.” It will have no basis in reality, but will sell like hotcakes to the public, particularly those independents who are already weary of the Republican social agenda. We get women’s groups to shout “How dare a group of old white guys try and control my body!” It will be beautiful. THE PRESIDENT: But I need the Catholic vote, I can’t alienate them! POLITICAL OPERATIVE: If the heat gets too hot, you can offer Cardinal Dolan some meaningless compromise that puts the Catholic Church back in line, yet only serves to stoke the fire on the far right. It’s a win/win. Then once you’re re-elected, you can just pull back the HHS ruling or provide a blanket exception to not-for-profits. No harm, no foul. THE PRESIDENT: You’re a genius, an evil, evil genius. POLITICAL OPERATIVE: That’s not all, the second prong of the attack is to get our media allies to ask questions about abortion ad nauseam with every far right candidate from the middle America. THE PRESIDENT: But hasn’t this been settled law for decades? POLITICAL OPERATIVE: Yes, but that won't stop Republicans from talking nonsense on the issue. With the proper monitoring, we’re sure to find one or two candidates going off script and saying something incredibly stupid. We can then use those comments as more evidence of the Republican “War on Women” - adding more shame to any independent thinking about voting Republican. THE PRESIDENT: Wow. I'm impressed. Done and done. THE PRESIDENT stands up and walks over to his phone and dials a number. THE PRESIDENT: I'm sending over a friend, do what he says and write him a blank check.